Peppermint is my top choice. I've recently become fascinated with packing light. It served me well when we traveled to Japan, and again when I did a "megatrip" through three states and their respective climates (including tropical Hawaii). One of the most indispensable products for these trips, however, has been Dr. Bronner's Castile Soap. Read on to find out why. Soap works for almost anything - hand soap, body soap, dish soap, laundry soap, etc. 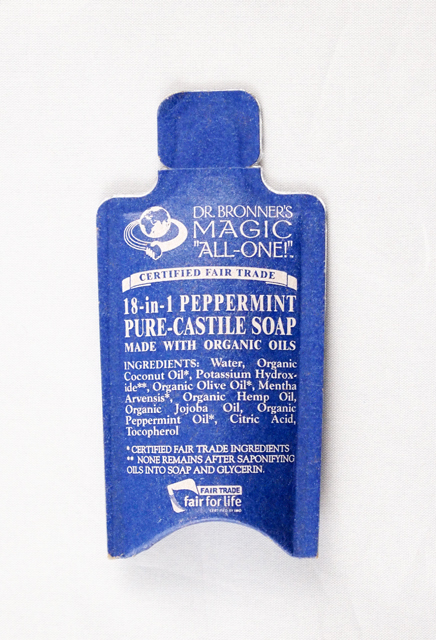 Dr. Bronner's peppermint castile soap is an essential item in my suitcase, especially when I'm staying in hotels. I can bring along my own oatmeal packets and use this to wash off my spoons and mugs. I can also use this in hotel sinks to do laundry. You can also use it as shampoo, body wash, and toothpaste, but I haven't tried them myself. While it is more expensive per ounce than laundry detergent, body wash, and other soaps, the versatility alone makes it worth the price - particularly when traveling. You don't need a large amount for most jobs, and the peppermint is great because it works well for food, clothes, and body. If you're looking to pack light, I highly recommend traveling with a small bottle of Dr. Bronner's.